In the pre-dawn hours of 30 June 2009, Yemenia Flight 626, an Airbus A310 (7O-ADJ), crashed during approach to Moroni in the Comoros Islands. As I did flight route forecasting for the Air Force in the 1990s, including in Kenya in 1994 for C-5 and C-141 operations as part of the Rwandan relief operation, I do take special interest in aircraft incidents where weather may have been a cause. The purpose of this weather analysis was to exploit meteorological data to determine if weather may have been a factor and if so to what extent, without indulging in speculation about the sequence of events aboard the flight. Flight 626 departed Sana'a, Yemen (IATA SAH, ICAO OYSN) at 29/1830 UTC (29/2130L) on a four-hour flight destined for Moroni, Comoris Islands (Prince Said Ibrahim International Airport, also known as Hahaya Airport, IATA HAH, ICAO FMCH, WMO 67002. The crash occurred at approximately 29/2250 UTC (30/0150L). The moon phase was a waxing half moon which set at 29/2123 UTC (30/0023L) in Comoros. Therefore there was no solar or lunar illumination available for visual reference, and this does raise the possibility of disorientation as a factor. So far, all available information has come from press reports. Gen Bruno de Bourdoncle de Saint-Salvy, French naval commander in the Indian Ocean, said the plane came down about 15 km (eight nautical miles) north of the Comoran coast (source). Another report indicates the crash occurred as the plane approached the airport; the plane "tried to land, but couldn't, and then U-turned before it crashed" (source). This gives a tentative position of roughly 11°14'S 43°19'E. The profile of the approach and the aircraft track is not known due to incomplete media reports and conflicting details about a missed approach. It is significant that Runway 20 would have been the active runway due to the strong southerly winds, requiring a nighttime VFR approach, however there are no published approaches for Runway 20 (source). The location north or northwest of the airport indicates the aircraft was not on a critical leg of its approach and probably was maneuvering at some altitude (3000 to 10,000 ft MSL) to establish itself on the approach. The surface analysis showed that the Comoros Islands was not in a typical trade wind regime driven by subtropical high pressure but was under the influence of a decaying polar front generated by a polar high that had spread into South Africa. At approximately 29 June / 0600Z, 17 hours before the incident, a decaying cold front arrived at Moroni with significant strengthening of winds and a shift from southeasterly to southwesterly. The air mass driving this front had been responsible for hard freezes in Zimbabwe Sunday and Monday (source). Though polar fronts are normally found only in temperate latitudes, their presence in tropical locations has been well-documented in the literature (Siquerra et al 2005). Figure 1. Manual analysis of the GFS surface chart on 30 June 2009 at 0000 UTC showing the strong incursion of stagnating polar air into the Comoros Islands region. Figure 2. 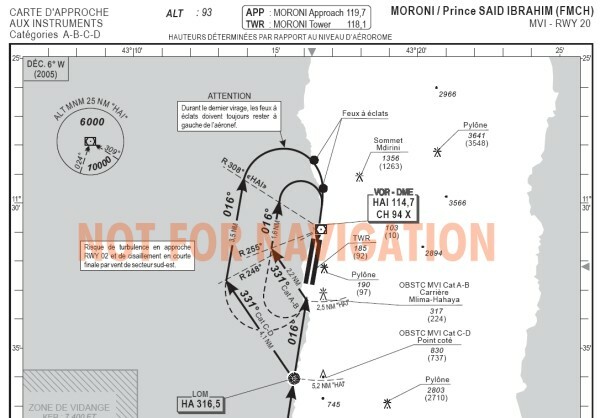 Surface chart and streamlines on 29 June 2009 at 1800 UTC several hours before the accident. This is just after sunset. A more detailed sequence can be found here. This shows that the strong winds are persistent, spanning many hours, and that cloud cover was generally less than 1/8th (mostly clear) at Moroni. Sea surface temperatures around the Comoros Islands were 26-27 deg C (79-81 deg F). The strong winds sustained to 29 mph, according to the basic Beaufort Scale definition, are associated with waves of 9 to 13 ft and this would be supported by the long southerly fetch from the Mozambique Channel. Preliminary model data from Oceanweather and FNMOC indicates significant wave heights around Comoros were on the order of 3 to 4.5 meters (10 to 15 ft), which would have caused significant problems for ditching, especially without visual reference. At the time of this writing, only 4 km infrared imagery was available and no calibrated spectral data. The 4 km imagery showed a quiescent weather pattern across the Comoros Islands with no deep convection. Layers of broken stratocumulus or altocumulus were prevalent throughout the Mozambique Channel. Due to limited resolution there was insufficient data to determine the extent and coverage of stratocumulus or stratus layers, but I will be trying to obtain some datasets tomorrow to ascertain this. Figure 3. METEOSAT infrared satellite image at 2230 UTC 29 Jun 2009, just minutes before the crash at Moroni (circled). The imagery shows only scattered stratocumulus layers in the region around Comoros. The weather enroute was mostly clear. Special thanks to Scott Bachmeier at SSEC, who has posted a nice loop of the imagery this evening. Yemeni civil aviation deputy chief Mohammed Abdul Qader said the wind speed was 61 km/h (38 mph) as the aircraft was landing (source). This is consistent with observed METAR reports. While these winds can significantly complicate approaches and takeoffs, a high wind speed in itself is ground-relative and does not affect on other phases of flight except for (1) causing course deviations off of presumed routes due to drift and (2) causing mechanical turbulence and shear especially near rough terrain. Scott Bachmeier of the University of Wisconsin Space Science and Engineering Center was kind enough to assist with imagery, and contributed these additional thoughts: "The Meteosat-7 IR cloud tracked winds certainly show the strong equatorward flow (~20-30 knots) that likely caused problems on the approach to the airport on the Comoros Island." Grande Comore Island, where Moroni is located, is a mountainous island about 10 x 30 miles in size with volcanic peaks to 2361 m (7746 ft) MSL that include Karthala, an active volcano. As a result, the island does significantly disrupt the lower tropospheric wind flow in a strong wind regime such as this one, and probably shares characteristics with similarly-dimensioned islands like Kauai, where damaging turbulence incidents have occurred in the past. 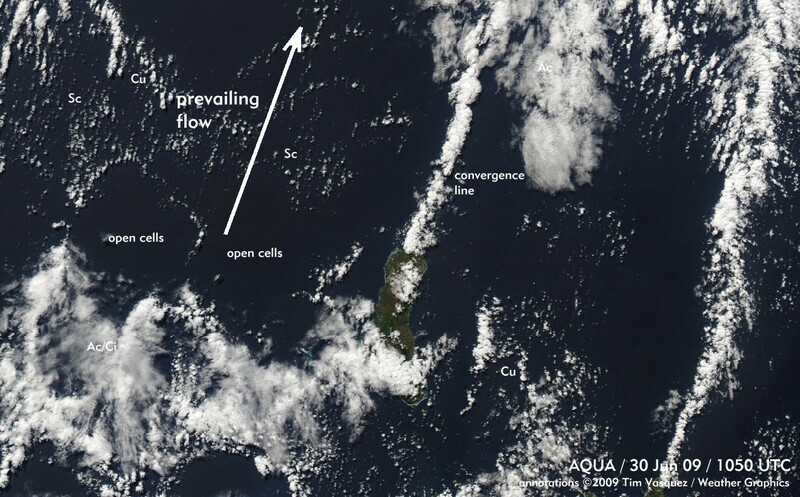 AQUA high-resolution imagery the next day indicated convergence line downstream from Grande Comodore and the presence of mesoscale open cell convection (see Agee et al. 1973 for more information) which is typical of a cool air mass over a warm surface. While this does not propose that any circulations existed which damaged the plane, it does highlight that the winds were likely variable and somewhat unpredictable, and some shear and turbulence may have existed in the lowest several thousand feet of the atmosphere. Figure 4. Example of wake flow around Guadalupe Island, Pacific Ocean, flipped on the horizontal axis to simulate the wind conditions affecting the Comoros Islands, and revealing von Karman vortex streets extending downstream from the island. 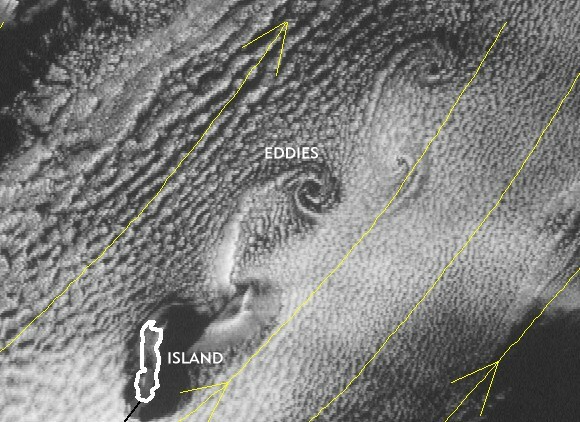 This is not to propose such eddies existed or presented any danger, but highlights the possibility of shear and variable wind conditions that could have added to the cockpit workload while maneuvering around the periphery of the island. Figure 5. Aqua ultra-high resolution image, 1050 UTC 30 Jun 2009, about 10 hours after the crash. This shows a convergence line downstream from Grande Comore Island, indicating that wake flow effects were occurring around the island. Again this does not propose any sort of link to the crash but indicates that variable wind and light to moderate turbulence may have been a factor as the plane was maneuvering near the island. The upper level charts for 250, 500, 700, and 850 mb showed Comoros Island to be situated along the tail end of a strong extratropical system associated with the polar air outbreak affecting Madagascar. Upper level winds were relatively weak and were dominated mostly by southwesterly cold air advection in the lower troposphere. Unfortunately Africa in general has exceptionally poor radiosonde coverage and the closest operating stations were in Madagascar (FMMI) (900 km south) and in South Africa. Antananarivo, Madgascar (FMMI) fortunately was in the same type of air mass as the Comoros Islands and is only complicated by its slightly higher elevation and inland location. The sounding confirms that most levels in the troposphere were being driven by strong advection of modified polar air from continental Africa. Fortunately I was able to obtain a model sounding from the NCEP GFS forecast model that was probably representative of conditions at Moroni. The strong flux of latent and sensible heat from the Indian Ocean (SST θ ≈ 300K) into a deep, cool polar air mass (θ ≈ 295K) produced an unstable boundary layer and shallow convection, however cloud production was not very extensive due to limited moisture in the air mass. Figure 6. GFS forecast sounding for Comoros Island at the time of the crash, produced at the FSL sounding generator. This uses the GFS model and is definitely not as good as an actual radiosonde observation but shows the cold air advection in the lower troposphere. Figure 7. The only available observed radiosonde sounding at Antananarivo, Madagascar, 900 km to the south. Antananarivo was more strongly under the influence of the baroclinic system crossing Madagascar. Once again we are left with another Airbus mystery, and while it appears certain that weather was not the cause, the weather conditions across the Comoros Islands were atypical and there is some possibility it could have been a contributing factor to the crash. Also a lack of illumination due to the absence of moonlight also raises questions. In summary, the meteorological conclusions are as follows. * Conditions enroute. Naturally, consideration must be given to whether damage may have occurred enroute from Yemen and manifested itself during the approach. A review of the satellite imagery showed most of the flight was completely free of weather. 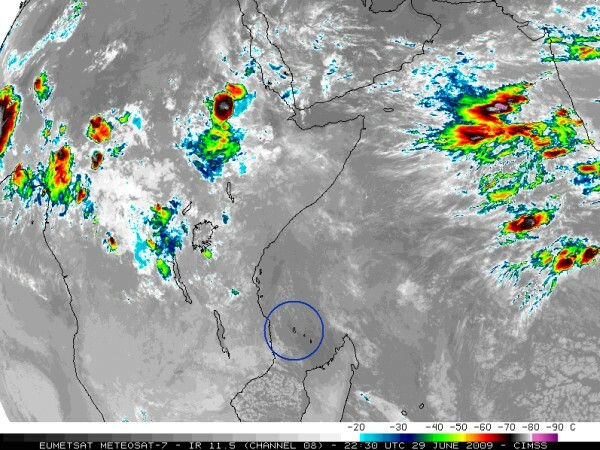 However a few strong cumulonimbus clouds (thunderstorms) were present in the Sana'a area at the time of the flight's takeoff. Sana'a reported no significant weather during the evening except for scattered cumulus and stratocumulus at 3000 ft most of the night, but satellite imagery (here) indicated thunderstorms in the area with -60 deg C tops, probably which were largely confined to orographically-driven storms on the mountains just southwest of Sana'a. These would have been decaying with the loss of solar heating. Until I get archival-grade satellite datasets, I cannot say how close the storms were to Sana'a International Airport or whether they may have been on the departure path, but it does appear they were within about 20 miles of the airfield. * Precipitation. The atmosphere at Comoros was far too stable to support deep convection (including thunderstorms). The cold air advection over warm ocean waters did produce sufficient instability for shallow convection, and large water droplets could have existed in these clouds. * Icing. Icing was not a factor. The freezing level was above FL150 with extremely dry air through at least FL350. * Turbulence. Light to moderate low-level turbulence is likely due to mechanical turbulence from the strong surface winds and cold air advection in the presence of diabatic heating over the warm ocean waters. This could have been compounded further by perturbations embedded in the wake flow downwind of Grande Comodore Island, where the flight is believed to have crashed. As the temperature difference between the water and the air mass was not substantial, it is not believed that severe turbulence could have occurred unless the flight entered a rotor directly downwind from (north of) the island's 7000 ft peaks. * Altimetry problems. The pressure was highly typical for tropical locations (1017 hPa, or 30.03 in Hg). If the aircrew had neglected to change their altimeters from 1013 to 1017 hPa from top of descent then the altimeters would have read about 120 ft low, thus controlled flight into the ground based on altimeter omissions can probably be ruled out; furthermore the warm tropical atmosphere causes the flight levels to be slightly higher than indicated. * Agee, E.M., Chen, T.S., and Doswell, K.E., 1973. A Review of Mesoscale Cellular Convection, Bull. Amer. Met. Soc., Volume 54, Issue 10 (October 1973) pp. 1004–1012. * Siquerra, J.R., Rossow, W.B., Machado, L., and Pearl. C.. (2005). Structural Characteristics of Convective Systems over South America Related to Cold-Frontal Incursions, Mon. Wea. Rev., Volume 133, Issue 5 (May 2005) pp. 1045–1064. If you have a comment, please send it here: servicedesk@weathergraphics.com . Due to very limited time I cannot provide assurances of a reply, but I will print anonymized comments from pilots and other aviation/weather professionals. Thanks. Although there appeared to be high winds from your analysis, [it is my opinion that] Yemeni Airlines is a bit of a shoestring outfit. They were almost blacklisted from flying into Europe awhile back. See: http://timesofindia.indiatimes.com/Yemenia-Airways-was-almost-blacklisted-in-Europe/articleshow/4721058.cms. They had 3 other crashes prior to this back in 2000 and 2001, (losing 1/4 of their fleet of 12), but none of it weather related. I do not think weather played much of a factor on this crash, but rather shoddy maintenance that Yemeni Airlines seem to have a notoriety for. I think all of us who ever flew on either African or Middle Eastern Airlines before, can all agree to that. But, it is good to have your forensic analysis of the weather conditions for that time. It would be nicer though, considering the amount of imagery that is put out at any given time all over the earth, if flight controllers were to have this information you provided before hand, so they can alert pilots. It has been my experience that many do not take the weather seriously, and that has been standard SOP for a long time. When something catastrophic happens, then all too often, everyone gets wrapped up on the aircraft's performance and mechanical failures, rather than paying attention to what the flight environment was like. As a consequence, they don't fully understand and respect the weather conditions as they should. But in the case of Yemeni flight 656, I would really have to question the mechanics as well as the pilot's judgement and competence, before making any links to it being weather related.. There are approach published for a visual approach at Moroni International - RWY 20. This approach can be shooted after an ILS approach RWY 02 , followed by a circling approach RWY 20. This might explain assertions made by witnesses declaring the airplane had made a go-around at low altitude !